This is one of my favourites. It's an old Delia recipe and one of the first things I learned to cook. I didn't eat it for about 8 years in its true form due to being vegetarian, but it's still really good with quorn chicken pieces. Marinade the diced chicken breast in the lime juice and zest for about an hour. While you're waiting, chop up the spring onions, coriander and chilli and set aside. Lightly salt and boil the water for the rice. Once it comes to the boil, add the rice and cook for about 11 minutes. Then, using a wok or large frying pan, add the dessertspoon of olive oil and cook over a medium heat. Add the chicken and fry until golden (about 5 minutes) and then add the chilli and fry for a further minute. Next, add the fish sauce, coconut milk (i usually use the low-fat version to make it a little healthier) and two thirds of the coriander and spring onions and cook for a further 6 or 7 minutes over a high heat so that the sauce reduces to about half. 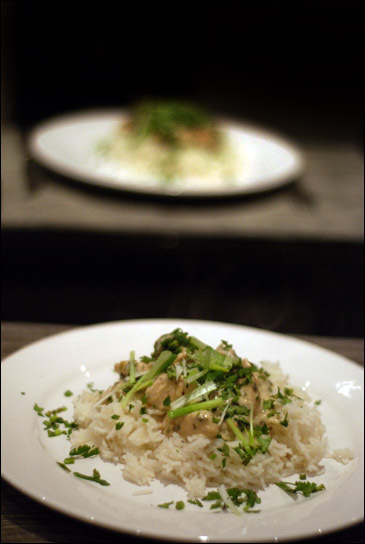 Drain the rice, serve, and dish up the chicken - garnish with the remaining coriander and spring onions. it's certainly one of my favourites! i hope you enjoy it as much as i do.